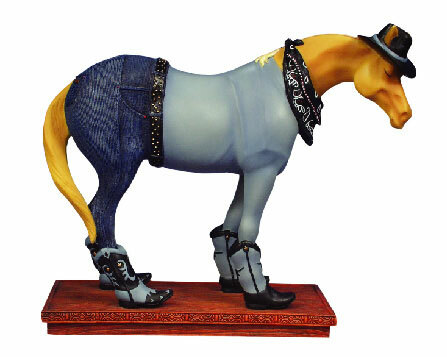 Boot Scootin' Horsey 1E | Retired Ponies Figurines | One Price Low Flat Shipping! From the Trail of Painted Ponies First Edition 1E Serial Numbered Collection, Boot Scootin' Horsey. Made of resin; Measures 6" tall. Mint condition in original box. This is a first edition painted pony model. These highly collectible versions are from the first production run manufactured, which is indicated on the bottom of the pony's base with the "1E" prefix before the hand-written serial number. Great addition for the elite Trail of the Painted Ponies collector!